The US Open golf tournament starts June 13th at Oakmont Country Club. If you are like most bars and restaurants you have one channel and one hole that you can show your patrons at any one time. With DIRECTV you can show them more US Open Golf! With the DIRECTV Mix Channel you can show your customers up to four screens of enhanced coverage of US Open Golf at once on Ch. 710*. 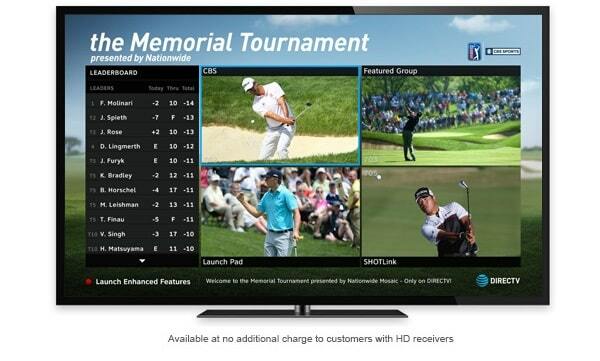 With DIRECTV’s exclusive expanded coverage you can show your customers up to 4 different live feeds. You can also give them the real-time updates and other tournament information your golf lovers want to know. DIRECTV gives you real time updates at the press of a button. Plus Video on Demand, Highlights, Interview and much more than you can only show your customers if you are on DIRECTV. All of this at no extra charge! *Mix channel only available on HD feeds. For full Mix Channel and interactive functionality, HD equipment is required. Available channels vary based on customer’s programming package. To access DIRECTV HD programming, HD equipment required.